I hate interruptions. Of any and all kinds. All the more so when I'm deeply immersed in doing something. And that is the very reason why I am not too fond of the television commercials, for they not only break the flow and rhythm of a telly-serial or a movie being shown on a TV channel but they also sometimes kill the momentum of a programme just when it would be getting exciting. Unless when I feel an urgent need to go to the bathroom or to answer a phone call or a knock on the door, I hardly ever get out of my seat while watching my favourite TV programmes. But sitting through the (sometimes seemingly endless) ad breaks and waiting for my favourite programme to resume, irks me to no end. Perhaps I might not have despised the ads as much, had they intruded only at the start of a programme and not in between. Not only do these ad breaks spoil my viewing experience but some of the ads are so inanely pointless and ill-conceived that they force me to change the channel, reflexively! But then, being the contradictory person that I sometimes am, there are also certain TV ads that I am very fond of and which pull me in, every time, for their sheer creativity and innovativeness or for their uniqueness or for the humour quotient or any relatable emotion they portray. One such pleasant and thoughtful ad to have come out in the recent times is the Parle-G brand's new campaign, "Roko mat, toko mat, inhe sochne do, mushkilo ke hal khojne do...", something that (I am sure) most of the viewers can connect with rather than just be passively viewing it. The lyrics of the jingle penned by the legendary poet Gulzar Sahab and sung by the versatile Piyush Mishra (of 'Maqbool' or Gulaal or 'Gangs of Wasseypur' fame) make it even more appealing. And the tagline ~ "Bachpan se badi, koi school nahi; Curiosity se badi, koi teacher nahi" (there is no greater school than childhood and no greater teacher than curiosity) so beautifully sums up the message the jingle intends to convey. Children are born curious and inquisitive and they always want to know all about what surrounds them. They are always keen to explore their surroundings and seek answers to the myriad of questions cropping up in their minds. It's this inherent curiosity of theirs that makes them want to touch, taste, see, smell and hear everything around them. They examine, they observe, they wonder, they ponder and then form their own unique perceptions of the world with their boundless imagination. But we adults as their parents or teachers or elders often thwart their curiosity, sometimes out of concern for their safety, sometimes out of fear of consequences of errors and setbacks, sometimes to avoid their plethora of probing questions, and sometimes just instinctively out of habit! "Don't do that", "Don't touch it", "Don't pick that up", "Don't go there" ~ though our intentions are good but in a way, aren't we teaching children to be afraid of getting hurt or falling down or failing? By thwarting their attempts to explore, aren't we robbing them of their ability to wonder and think creatively? It's understandable that as adults, it's often not easy to sit back and let children take risks and explore at the expense of their safety. No one would want a child to get hurt or break an arm while trying to find answers to questions that intrigue them. But then, a broken arm heals up... a broken spirit doesn't! Our educational system is also focused more on feeding facts to the children rather than on encouraging their curiosity and inquisitiveness and thereby fuelling a passion for discovery and invention. Schools and colleges are increasingly emphasizing more on the importance of 'performance' and 'results' rather than encouraging children to demonstrate their intellectual prowess. We have led children to believe that scoring 'A' grades in exams and thereby getting a good job is the goal of their education rather than exploring creative ideas and building analytical skills for real life situations. We are focused more on 'education' rather than on 'learning'. There is a marked difference, I believe, between 'education' and 'learning' - one can be educated and yet not be learned; one can be well-informed and yet be unimaginative. When children are repeatedly discouraged from exploring and finding answers, their passion gets crushed and they too gradually stop questioning and imagining. And soon they lose their innate curiosity as well and with it, also their desire to know more. Because in the absense of curiosity, nothing can enthuse or motivate children to experiment and discover. Why can't we let them experiment independently and learn from their own failures and mistakes? That is how they can develop confidence. After all, as Will Rogers once famously said, "Good judgement comes from experience, and experience comes from poor judgement". We adults were also born curious. We too were once willing and eager to explore new ideas. But our curiosity got bruised in some way or the other at all levels while growing up. And our desire to be perfect has now stripped us of our ability to deal with failures. Today we have stopped questioning what we see or read or hear, we have stopped wondering and pondering, we have stopped experimenting and tinkering.. instead we are just turning to 'doing what we had done before’ or choosing ‘the low risk’ path! But the kids have no damaged sense of curiosity as we adults have. And almost every child is blessed with an ability to rebound from setbacks. So why should we adults have to, knowingly or unknowingly, discourage their creativity through our words and actions? 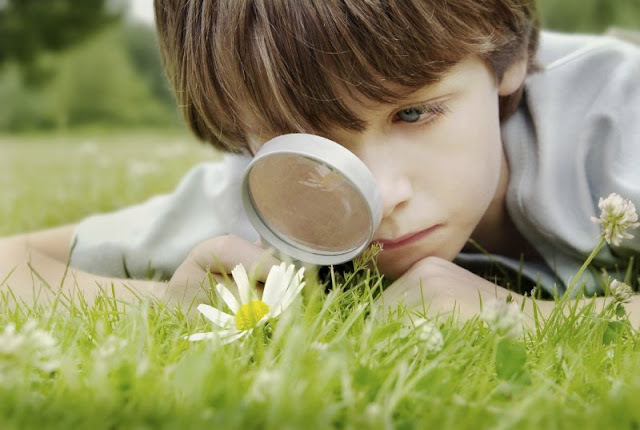 Curiosity and wonderment is inherent in every child (in adults as well)...what we need to do is not to kill it. What the children (and the adults) need is our encouragement to ask questions, to develop new questions, to look for multiple answers and to take risks without any fear of failure. What they need is to be reassured to see mistakes as opportunities for growth and learning and not as evidence of inadequacy. Aare, ande ke andar hi kaise udenge yaar?" Kitaabon ke baahaar, kitaabein bahot hain..."
Simple are the lines and yet crisp is the message being delivered ~ Let them explore every field of thought with unbridled curiosity! (And this applies to not just the kids but the grown ups as well).